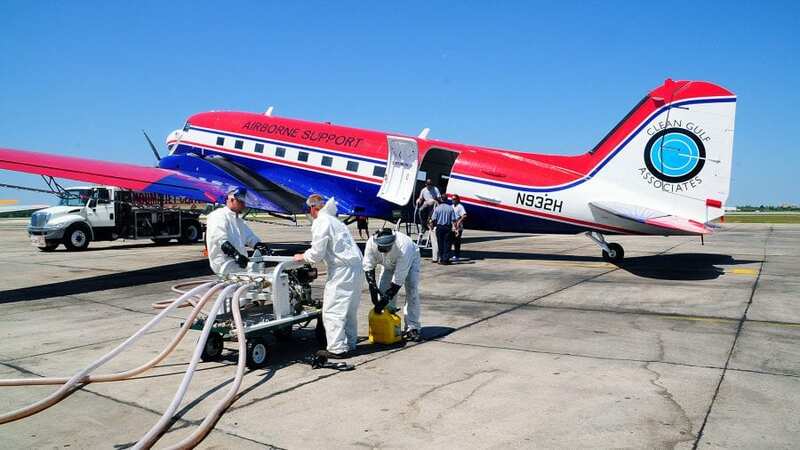 Responders conducted 412 flights to spray chemical dispersants onto oil floating atop the Gulf of Mexico during the Deepwater Horizon crisis in 2010. New studies led by scientists at Woods Hole Oceanographic Institution show that oil is rapidly photo-oxidized by sunlight. Dispersants are much less effective at breaking up photo-oxidized oil.So the window of opportunity to use dispersants effectively is shorter than previously thought, especially in sunny weather. The 2010 Deepwater Horizon oil spill in the Gulf of Mexico was unquestionably a tragic disaster. But many scientists found silver linings—a way to extract some good from a bad situation. This unprecedented oil spill provided a unique opportunity to learn what really happens to oil in the real world—to see what happens to oil when all the forces of nature act on it and when people intervene to clean it up. Some scientists at Woods Hole Oceanographic Institution (WHOI) took advantage of the spill as a grand experiment—one that could never be done intentionally or simulated in a lab—to try to figure out better ways to combat oil spills in the future. “Sometimes we look at an oil spill like a crime scene,” said WHOI marine chemist Chris Reddy. In this case, twenty researchers in his lab and collaborators from more than a dozen other institutions followed a trail of clues like detectives to solve a mystery. Eight years later, following that trail, Reddy and his WHOI colleague Collin Ward believe they have found a key piece of compelling evidence that has been overlooked in the past: Sunlight plays a critical role in oil spills. 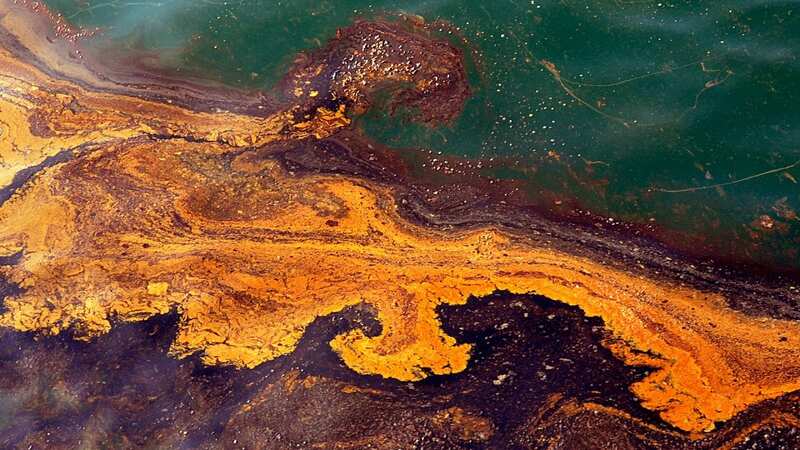 Light energy rapidly oxidizes oil floating atop the ocean—dramatically altering the chemistry of oil compounds. Those chemical changes may substantially change how people should approach cleanups. The new findings mean that sunny or cloudy days make a difference on the effectiveness of chemical dispersants used to break up oil into tiny droplets and reduce the amount of oil that reaches sensitive coastlines with valuable fisheries and tourist industries. In addition, new tools and protocols may be in order to clean up previously neglected oil compounds that have been oxidized by sunlight. The scientists examined Deepwater Horizon much the way medical scientists study the progress of a disease in search of a cure. Promising drugs or methods that work on mice in the lab don’t always translate into cures for humans. That’s why we have clinical trials to test the efficacy and safety of drugs on people. Oil spill scientists don’t get many “clinical trial” opportunities to test procedures to clean up spills. Deepwater Horizon offered that chance. This story begins in the late 1960s and early 1970s, when several scientists, well ahead of their time, reported results from lab experiments showing that light rapidly transforms oil compounds into other chemical compounds. Light energy breaks chemical bonds in oil compounds—splitting off atoms or chemical chains and creating openings where oxygen can attach. The oil becomes photo-oxidized. The process (also known as photochemical “weathering”) is similar to the one that causes paint on your car or colors on your clothes to fade if they are left out in the sun for too long. Unfortunately, those scientists’ work never gained much traction—likely because they never had any opportunity to prove that what they observed in a beaker in the lab also happens across vast territories in nature. Deepwater Horizon released nearly 500 million barrels of oil and gas into the Gulf of Mexico. The oil gushed for 87 days from a broken pipe nearly two miles beneath the sea surface. A large percentage of the oil and gas never rose to the surface but, under deep-sea pressure, formed a plume that streamed through the depths—a phenomenon that had never been seen before. At the time, Reddy was less excited about what happens to oil on the ocean surface. That’s a common occurrence in oil spills. He was more eager to investigate the extraordinary deep-sea oil plume, and he and colleagues mobilized aboard the research vessel Oceanus. Reddy and colleagues found and mapped the deep-sea plume. Then his lab continued its research, focusing on what happens to oil after it lands on beaches. In the months and years after Deepwater Horizon, he and his colleagues scoured beaches and islands in many states throughout the Gulf Coast to collect sand patties—bits of oil breaded like onion rings with sand. Back in the lab at WHOI in 2011, Reddy’s lab technician, Catherine Carmichael, was tasked with washing all the oil out of the sand, measuring its volume, and running it through a standard analytical tool—a gas chromatograph—to determine what compounds were in the oil. Her results turned up something completely surprising: The gas chromatograph detected only about half of the oil that should have been in the volume of oil she analyzed. Reddy thought something had gone wrong, as sometimes happens, and asked her to run the analyses again. The results were the same. So Reddy ran the analyses again himself. Which is when it dawned on Reddy: Gas chromatographs don’t detect oil compounds that have been heavily oxidized. 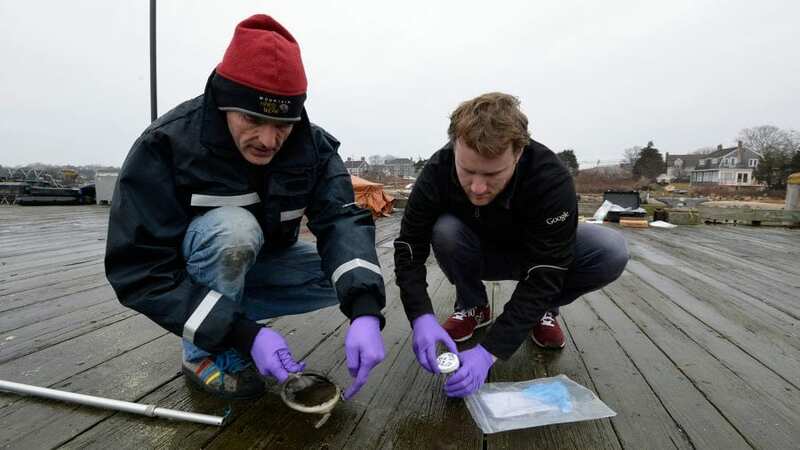 “We began to suspect that maybe something happened to the oil before it hit the beach that caused it to be oxidized and no longer detectable with gas chromatography,” he said. Those old scientific lab studies about light oxidizing oil came back to mind. If that’s what happened, it would have happened when the oil was floating on the surface exposed to sunlight. And that made Deepwater Horizon an ideal arena to test whether the photo-oxidation of oil that occurs in the lab also happens on a large scale in the real world. In most spills, the oil quickly flows away from the scene before anyone can grab samples of it. During Deepwater Horizon, the faucet was on for 87 days. Plenty of oil floated on the surface of the Gulf for 102 days. “That’s when we began to kick ourselves for being right there and not collecting oil slick samples that we now needed to explore this hypothesis,” Reddy said. They were stymied—until the fortuitous cameo appearance of a baby named Abe. Sorry Abe—that sample of floating oil was valuable for science. Christoph Aeppli, a postdoctoral scholar at the time, got the assignment of testing their hypothesis. Sure enough, he showed that the oil had been oxidized. Results of the study were published in Environmental Science & Technology in 2012. “Many people were skeptical about the results,” Reddy said. “We thought we had it right.” But to remove doubts, they shared samples with Ryan Rodgers and Amy McKenna at Florida State University who used facilities at the National High Field Magnetic Laboratory to show that the oil samples were indeed enriched with oxygen. Ward read the study in Environmental Science & Technology, and it sparked an idea. At the time, he was working on his Ph.D. at the University of Michigan, studying permanently frozen soils (permafrost) in the Arctic. Permafrost is full of organic carbon that can be flushed into rivers when it thaws. The crux of his research was that global warming threatens to thaw the permafrost and oxidize that organic carbon back into carbon dioxide, releasing more of that greenhouse gas back into the atmosphere. He was specifically interested in how—and how fast—sunlight oxidized permafrost’s organic carbon. Aeppli’s work had shown that the scientists were on the right track. The problem was that Abe’s sample, and a few others they got ahold of, didn’t provide enough, or good-enough, evidence to make a convincing case: The bosun had no reason to take notes, so there was no way to know exactly when and where he skimmed the sample. To prove their case, the scientists needed more incontrovertible samples. They knew such samples existed. The government had collected its own evidence for its multibillion-dollar legal case to assess damages against BP, the oil company responsible for the spill. The Oil Pollution Act of 1990, enacted in the aftermath of the Exxon Valdez oil spill, mandates that meticulously controlled samples be collected and analyzed for a list of toxic chemical compounds. These analyses are the evidence to determine damage assessments. Following the law, government responders had diligently collected and punctiliously documented oil slick samples from the Deepwater Horizon spill. Unlike like the bosun’s sample, whose precise provenance was nebulous, “you could practically know what the government samples’ mothers’ Social Security numbers were,” Reddy said. Somewhere along the line, Reddy was told where the samples were. They were frozen and stored at Alpha Analytical, an environmental testing laboratory in Mansfield, Mass.—just an hour up the road from Woods Hole! So close! But so far away—because they could not be touched until the government settled its $16.65-billion damage assessment case with BP. When they got the call in 2016, they drove up to Mansfield, loaded a truck with twelve coolers-full of samples, got back to the lab, and went to work. These samples were a gold mine because they came right from the Gulf of Mexico, and the scientists knew when and where they were collected. They could measure how much oxygen was in the oil and correlate that with how long it had been floating on the sunlit sea surface—something that has never been done for any oil spill and most certainly cannot be done in the laboratory. But how was the oil oxidized? Next, they analyzed hundreds of samples for dozens of chemical markers that would indicate that the oil was oxidized by marine microbes. They found no evidence that microbes were responsible. That left sunlight as the culprit. 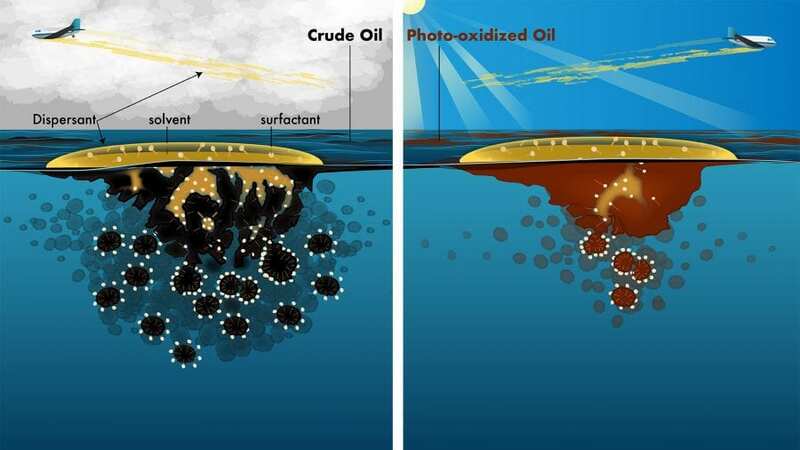 A key point to all this is that sunlight does not remove oil from the sea surface. Microbes will use the oil as food, turning it into carbon dioxide and biomass. Oil can evaporate into the atmosphere. But sunlight simply changes oil’s chemistry and leaves it on the surface. The scientists realized that this could be a problem for responders charged with cleaning up oil spills. Why? 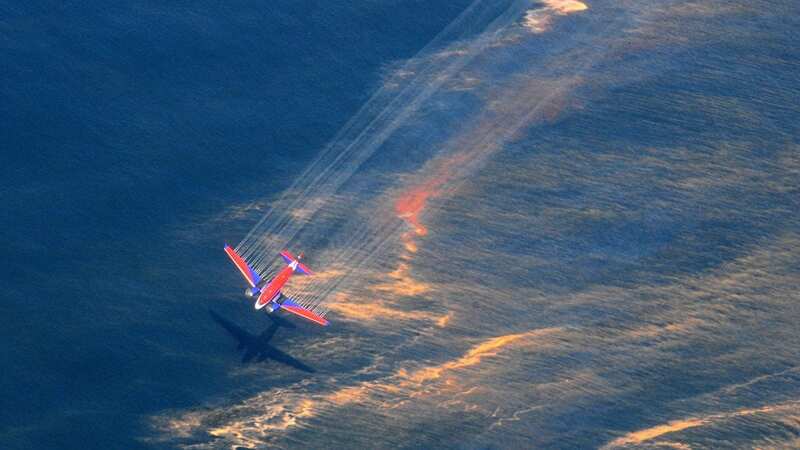 Because a major weapon that responders use are chemical dispersants sprayed onto the ocean by airplanes. But how effective are dispersants on photo-oxidized oil? Dispersants contain detergents, not unlike those people use to wash dishes. 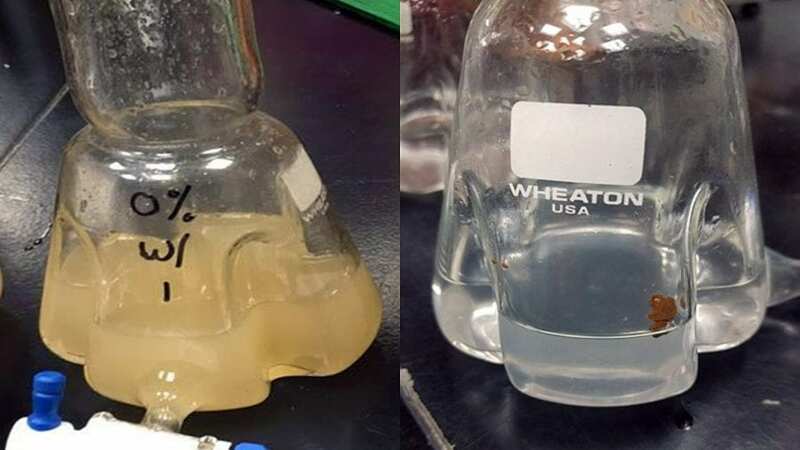 They help break oil into small droplets that can become diluted in the ocean and/or are eaten by microbes before the oil can be swept to sensitive coastlines. To do their work, however, the detergents (also known as surfactants) first need to mix with both the oil and water—and oil and water, famously, don’t mix. To overcome this barrier, dispersants contain an organic solvent that helps the oil, detergents, and water to mix. Until this key step occurs, the surfactants can’t do their work to break oil into droplets. Once again, those oil samples collected during the Deepwater Horizon disaster were crucial. The scientists ran a series of tests on the oil under meticulously controlled laboratory conditions to prevent temperature changes, evaporation, light infiltration, and other potentially contaminating factors. They exposed the oil to increasing durations of light (and no light, as controls). 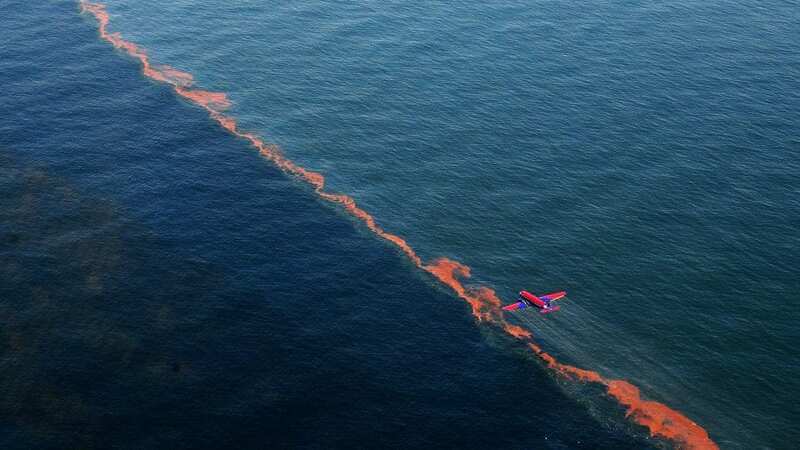 They fostered a collaboration with Robyn Conmy, one of the U.S. Environmental Protection Agency’s leading experts on developing new technologies for responding to oil spills. They used the same protocols EPA uses to conduct tests on the effectiveness of dispersants. For the experiments, Conmy loaned them the custom-designed glassware that the EPA uses for its tests. The experiments showed that a few days of sunlight exposure reduced the effectiveness of dispersants by at least 30 percent. Next, the scientists teamed with Deborah French-McCay, an internationally recognized oil spill modeler at RPS ASA, a science and technology consulting firm in Rhode Island. Her model simulated the environmental conditions that occurred during the Deepwater Horizon spill, including factors such as winds speeds and sunlight levels. Then they superimposed on the model all the 412 actual flight paths of planes that sprayed dispersants during the crisis. The results showed that under average wind and sunlight conditions, the majority of dispersant applications would not have achieved even the minimum effectiveness levels designated by the EPA, because they targeted photochemically weathered oil. Dozens of aerial dispersant applications still would not have achieved EPA-designated effectiveness levels even under the best-case scenarios for aerial dispersant spraying: cloudy weather (which would limit photochemical weathering) and high-wind conditions (which would transport oil farther from the spill area before sunlight transformed it). After eight years on the case, the scientists presented their evidence in the April 25, 2018, issue of Environmental Science & Technology Letters. Their study challenges the current way of thinking that sunlight can be ignored in oil spill cleanups. If the results are borne out, it means that responders may have much shorter windows of opportunity than previously thought—especially in sunny weather—to apply dispersants effectively. Ward and Reddy say they are passing no judgments on the pros and cons of dispersant use. They just wanted (pardon the pun) to shed some light on the situation. “We are simply providing more knowledge to help officials refine decisions on using dispersants in ways that are most effective,” Ward said.